The Disappearing 4-Patch or 4 to 9-Patch starts with a 4-patch block with good contrast in colors or shades and tones. The one below was made with 5 inch squares and it will finish to a 8.5 inch block from raw edge to raw edge if accurate scant 1/4 inch seams are used. Next, make 4 cuts without moving the block or the cut pieces. Use a small mat so you can turn the block without disturbing it. Using the center seams as the reference point, measure out 1 inch and make a cut; then make a cut on the other side of the seam. Rotate and repeat, measuring 1 inch from the center seam for each cut. Next, rotate only the center outside sections 180 degrees as shown in the photo below. Sew the sections together as shown in the next two photos to complete the block. There you have your new 9-patch block. You can vary the look by the width of the cut. 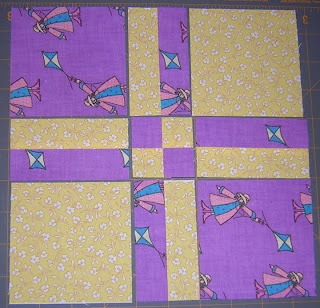 This block makes a great charity quilt because it is fast to sew and looks complicated. 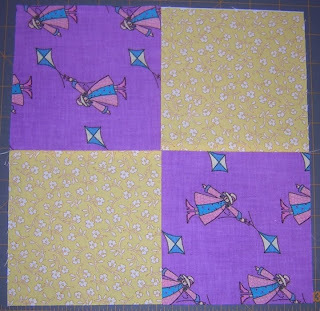 This block can be done starting with a 9-patch but using a 4-patch allows one more freedom to get the look desired by varying the width of the measurement from the center seam. Hi, Sally! Loved your fabric choices and this looks more fun than the disappearing 9 patch. Just have to comment on the oh so cute baby. However did you get him to smile like that? Debra B.
I love your instructions. Thanks so much. Thank you for the pictures of the disappearing 4 patch. Also is this a copyrighted pattern? Or do you know the source of the orignal creator of this pattern? I don't know the source of the pattern. We were discussing it versus the disappearing 9 patch on an email list. When googling didn't turn up any instructions (nor a pattern), someone offered a drawing she had done in an art program as an illustration of the process and another recommended her preferred block and cut size. Another member wanted a tutorial so I offered to do one. That is how it ended up on my blog and that is all I know about it. Thanks nice idea to pass along to my quilting group, I had not seen it done this way before! Thank you so much for the great tutorial! This would be perfect for a quick baby quilt or charity quilt. looks simple enough....thanks for the post! I like your 4 patch blocks...something new to try. Thanks for sharing! Wow! I can't wait to try this technique! Thanks for sharing this cleaver idea. I am always looking for new ideas for comfort quilts. What a terrific block comes out of a 4 patch. Thanks for posting it. I'll be sendng my friends here to read your blog. WOW! I had no idea this tutorial would be so popular! I am happy to see it was helpful and inspiring. add me to the list of grateful recipients. Thanks so much for this great tutorial. this is such an amazing block, from humble beginnings. Yay - a fun, simple block! Your instructions are great. Just want to clarify your copyright position. I'm a quilting instructor and would gladly reproduce your directions for my students. Is that ok with you? I'd estimate that would be at most 20 students this year. Annie, you are welcome to use the instructions in quilting classes. This technique is was discussed on a sewing list. Several had done it before and others were confused since they were familiar with the Disappearing 9 Patch block. I offered to do a tutorial to clarify the process. I have no idea where the block originated. I am wanting to make a twelve and a half finished block of this for a swap. I am not very good at figuring out the cuts. Can you give me a hand with it? Start with 7 inch squares and you will end up with a block that is 12.5 inches, raw edge to raw edge. Use scant 1/4 inch squares to guarantee accuracy. Note: The size increase is .5 inches per square to allow for the amount taken up in the new seams. So, a 6.5 inch block requires 4 inch squares. A 4.5 inch block would need 3 inch squares; etc. Thank you ever so much! Have a wonderful week. I really enjoy your blog. I just found it and I hope to be a regular from now on. I tried this pattern over the weekend. It was easy and soooo cute. (I couldn't get a consistent 8 1/2 finish, so I trimmed all the blocks to 8 1/4) After I had it all laid out in floor, I decided to rotate a few of the blocks. The design came out fantastic!! I just couldn't get over myself....LOL. Thanks for this tutorial - it was great! 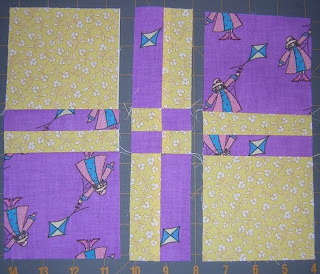 Beth, this is a block pattern where you can live with less than accurate scant 1/4 inch seams. Unless of course, you swap them with someone who gets their blocks to turn out right on. Your solution works. But someday, I plan to do a tutorial on scant 1/4 inch seams for accurate blocks. 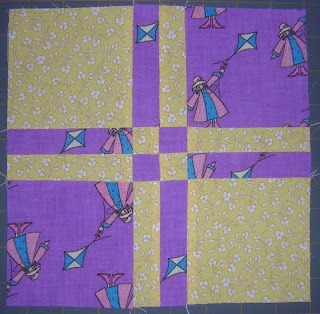 The scant 1/4 inch seam makes a difference when the block has lots of seams and triangles. I just found your tutorial this month and am using it to make a baby blanket. Thank you so much. A friend sent me here and I am so glad. I have had great fun making black and white music themed blocks but now what?I can't figure out what step I like to sew them together.Some are on the wall now with green strips that match the backing between them I also have some strips set aside to piece more 4 patch sashing blocks. Those who have put some blocks together have you any suggestions? I am writing on behalf of a friend without a google account. She loved your tutorial and demo'd how to make this block to her guild last night & everyone was really impressed with what a neat block you end up with after starting out with such a plain jane 4 patch. Great quilts, Helen!! Thanks for sharing the links!! All I can say is "WOW" and "Thank You!" Thanks for a great idea! Can;'t wait to try it! Despite everyone saying how easy this is I am so confused! I made the 4 patches and now I am ready to cut. I understand how to make the first cut. I make the next cut on the same one? Will, you have to make 4 cuts on your 4 patches. Use a small mat. Make two cuts across your block on either side of the center seam, then without disturbing your block, rotate the mat and make the same two cuts across the block, perpendicular to the previous two cuts. Now, all you have to do is rotate the small rectangular sections 180 degrees, leaving all the squares in place. Your pieces will be ready to sew back together. I am just starting and I don't know how to figure how much fabric to buy. I need to a queen size. I love the disappearing 4-patch. How do I figure out how much to buy. For a starters, you need to know how big your queen quilt will be, then how many blocks you need in each direction. 1 yard of each fabric for a two color quilt makes about 24 blocks that finish 8 inches square in a quilt (if you use accurate scant 1/4 inch seams). If you plan on a standard queen quilt (not bedspread), they measure about 86” x 93”. My figures say you will need 11 blocks by 12 blocks, for a total of 132. Divide that by 24 and you get 5.5. So get six yards of each fabric to be sure. You'll need less fabric if you choose to use borders to frame the blocks but the modern look is generally no borders. Try cutting the same way, but on the corners. I will be doing this as well as the one I described as a tutorial when I get my sewing machine repaired. I'm a quilter wannabe and I think I am going to try to try this. Thanks for sharing! what a great tutorial. Thanks. Thanks, this is areally good block to make! Might try it Friday at my quilting group! How neat is that? I love that. YOur pictures are great. I will keep that on my mind...it looks very nice. Hope you have a really nice day and the weather is more springlife today...ours has been that way and I'm loving that. This looks like a great block. Thanks for sharing. I am going to try this one soon. 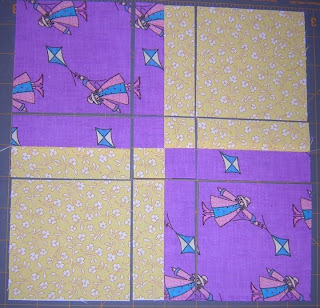 I'm just starting a new baby quilt, saw this design, and googled it. You popped up. Thanks for posting your directions/process! I was just guided to this tutorial and I love it. It will make a quick charity quilt in any colors. Thanks for sharing. Sally, I will be sending a few quilters to this tutorial. I made several D4P blocks on my vintage machines at my guilds quilt show this past weekend. Several ladies asked me about this pattern, and I told them I'd send them the link to your tutorial.